The World's Largest & Original "Stunt Dog Show"
Receive more info about booking "All-Star Stunt Dog Show" for your event! All-Star Stunt Dog Show is a family owned business led by husband and wife team Chris and Suhey Perondi along with their son Anthony. Chris Perondi's parents, Lon and Donna are also an instrumental part of the business assisting in costume design, prop creation, advertising, caring for the retired dogs while Chris and Suhey are on the road, and much more. This family business originally started in 1999 and has since produced over 8,000 live shows. It has been through changes over the years, but has evolved into one of the largest touring animal acts in the world, with up three touring units serving the United States and Canada. All-Star Stunt Dog Show currently offers two full-time traveling teams, both offering the same high-energy shows that are written and created by Chris Perondi. Every show is extremely visual, scripted, has seamless transitions, choreographed to music, professionally presented on the microphone, and features the most talented dogs in the world! 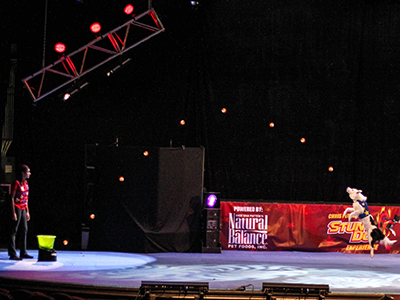 All-Star Stunt Dog Show teams up with only the best dog trainers and performers in the country. The Perondi's have brought dozens of trainers into their "Stunt Dog" family over the years and have assisted numerous trainers in getting their start in the industry. Trainer Abby Cline currently leads the Perondi's second team. Cline is from Fargo, ND and her team of dogs has been apart of the family since 2009. All the dogs in the shows are trained using positive training methods with the use of a clicker and toy motivation. They each have unique talents and signature moves to showcase. The Perondi's work with each dogs individual ability, athleticism, and intelligence. Then place them in segments that they excel the most. The dogs enjoy performing because they are doing what they love. Every show is enthusiastic with more energy than the last! All the Perondi's and Cline's dogs have been rescued from pounds and shelters from across the country. Their mission is to promote pet adoption, responsible pet ownership, and educate on the importance of spay and neutering. During every show they take time to share their mission and encourage everyone to spend more time with their pets at home. All-Star Stunt Dog Show is proud to support and promote the efforts of the Lucy Pet Foundation (www.lucypetfoundation.org/), A Place to Bark (www.aplacetobark.com), the Shepherd of the Hills Humane Society (www.bransonhumanesociety.com), and many more local rescue organizations across the country! "The stunt dogs and team last night were AMAZING! Honestly they were the absolute hit of the evening. The crowd loved them and they were perfect. There's no way we can't have this performance back on campus!" All-Star Stunt Dog Show leads the way in canine entertainment with one-of-a-kind interactive live shows that captivate audiences of all ages! Since 1999 creator and executive producer Chris Perondi has entertained millions and has produced over 8,000 live shows in North America. Offering the world's first and original "Stunt Dog Show". If it's not brought to you by STUNT DOG PRODUCTIONS, it's not a "Stunt Dog Show". Many have tried to imitate, but none can duplicate! Our original "Extreme Canines Stunt Dog Show"TM took the U.S. by storm as a nationwide touring act in 2001. Over the years we have entertained millions at major theme parks (Dollywood, World's of Fun, ValleyFair!, Stone Mountain, & Knott's Berry Farm) and at some of the largest fairs in the country (Minnesota State Fair, Iowa State Fair, New York State Fair, Los Angeles County Fair, and more), not to mention numerous sporting event half-time shows for the National Football League, College Basketball & Football, and Minor League Baseball. In 2009, after our appearance on the Oprah Winfrey Show, we launched our performing arts theatre stage show production titled "Chris Perondi's Stunt Dog Experience"TM. This production has reached new heights in the performing arts industry and is one of our most booked and sought after productions. The "Stunt Dog Experience"TM tours in the spring and fall across the country at dozens of performing arts venues every year. It consistently sells-out and has an 80% re-booking rate. We have also produced this highly acclaimed stage show for the "Red and Gold Heritage Hall Theatre" at the Silver Dollar City Theme Park (2010, 2011, & 2013) and at the "Celebrity Theatre" at the Dollywood Theme Park (2013). These were both 50+ day production runs! Our specialized high-energy stunt dog shows are visual, unique in format, professionally presented on the microphone, have seamless transitions, are choreographed to music, and feature the worlds most talented performing dogs. It's guaranteed our productions will leave your audience in awe by offering shows in a variety of themes and formats. From performing arts theaters, theme park stage shows, to outdoor on-ground entertainment you will be guaranteed to get the most incredible dog show on earth! 16. JUMP ROPE DOGS, One jump, two jump, and more! 20. "DOG-GONE FUN" AUDIENCE INTERACTION, It's not just a show, it's an experience!